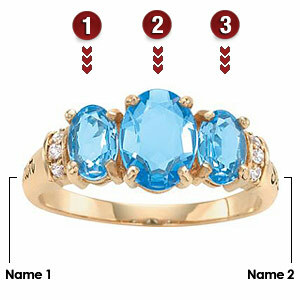 The 10kt yellow gold Reverie ring is set with three oval genuine gemstones: one 8x6mm, and two 6x4mm stones. Six 1.3mm round white accent stones. Engraving areas 1 and 2 accommodate up to 10 characters, including spaces and punctuation. Import. Mothers ring. Very pleased. Wear it constantly and am very glad I made the purchase.